This will strike some as an odd statement, but I think I am the sort of person most likely to be receptive to the much-maligned Ghostbusters (2016) remake. First, I have been a fan of the original Ghostbusters (1984) film since seeing it in the theater upon release. I've owned it on VHS, DVD, and Blu-ray. In fact, it was one of the first Blu-ray discs I bought. Despite being a fan of the original, I am not one of those who has placed any of its cast on a pedestal and decided that they can do no wrong. I like everyone in the cast of the original (especially Sigourney Weaver and Rick Moranis), but I was open to the idea of remaking this film with a different cast. I didn't think a remake was needed, but I knew I'd eventually see it if there was one. Second, I am a fan of each of the four women cast in the lead roles of the remake: Kristen Wiig, Melissa McCarthy, Kate McKinnon, and Leslie Jones. I've loved Kristen, Kate, and Leslie as regular cast members on Saturday Night Live, and I have enjoyed the few films I've seen Kristen in. While my reactions to Melissa's films have been a bit more mixed, I thought some of them were really funny. And of course, her portrayal of Sean Spicer on SNL was pure gold. I think that all four women are extremely talented, funny, and I have appreciated their particular brand of humor in almost everything I've seen from them. When I first heard that a remake of Ghostbusters was in the works, I was curious. When I heard that these four women had been cast in it, I was intrigued. Obviously, it was going to be different from the original. But with a cast like this, it would probably be much funnier than the original. Despite seeing some bad reviews and hearing about a brewing controversy around the film (something to do with some men being upset over the casting of women as the main Ghostbusters), I went into it with high hopes. I figured that the reviews were probably too harsh because they were making unfair comparisons with the original. Even if it wasn't as good as I was hoping it would be, I was sure I'd enjoy it. Aaaaaaand I was very wrong. I can honestly say that Ghostbusters (2016) was one of the most disappointing films I can remember seeing in a long time. Despite that amazing cast, I did not laugh once during the entire movie. Not one damn time! I kept waiting for it to get better, but it was not even mildly funny. I am not going to compare it to the original because I was prepared to appreciate it on its own. I came away completely puzzled. It clearly was not intended to be a horror film, but was it not supposed to be a comedy either? 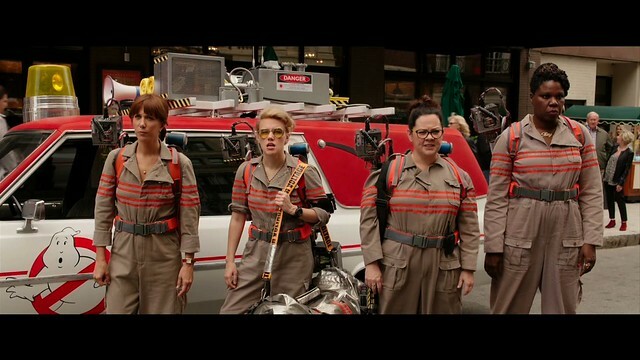 Wiig, McCarthy, McKinnon, and Jones have been funny in everything I've ever seen them do...until Ghostbusters. My suspicion is that the failure of Ghostbusters (2016) must have had to do with the writing. It was as if the writers on the film decided not to write any jokes or comedic scenes. Even the most talented comedian is going to falter in a film if she is not provided with any opportunities to be funny. It seems like that must have been what happened here unless the leads were explicitly forbidden from being funny by the director, and that seems unlikely. Ghostbusters (2016) wasn't a terrible film because of anything to do with gender, casting, or social justice; it would have been a terrible film with this sort of writing/direction no matter who had been cast. In the end, the big disappointment for me had nothing to do with the original film. It had to do with the bizarre waste of talent. Again, I cannot blame the four women for this because they are almost always funny. The fault would seem to lie with the writers and director.